Dendy Platt, Honorary Senior Research Fellow, School for Policy Studies, discusses the challenges currently facing professionals involved in the assessment of the needs of children and the increasingly difficult environment in which they operate. Children in need and child maltreatment can be emotive topics. A constant question that lurks at the backs of the minds of those of us involved professionally with assessments of the needs of children, is that “someone, somewhere must know more about children and young people than I do”. And that whoever these experts are, they “must surely have the answers to the assessment dilemmas regarding the children I am working with”. This nagging search for solutions becomes even more acute in the context of the years of austerity measures currently facing the range of services for children. UK politicians will claim that overall spending on children’s services has gone up in recent years. However, the greatest part of this increase has been absorbed into funding the growing numbers of children in the care system. Yet at the same time, and probably contributing to increases in number of children in care, has been a hidden, but very serious decrease, estimated as a 60% spending reduction, in preventive services for children and young people in need (for example, youth services and children’s centres) . Alongside this wholesale withdrawal of support for children in need, child poverty rates have been increasing. So, with fewer services and more children in need, it is unsurprising that numbers of children in care have been going up. Maintaining a focus on the child is a long-standing principle. Time spent, on understanding the lived experience of the child you are assessing, can lead to better, more thoughtful decisions which save time in the long run. If you’re looking for a questionnaire or measurement scale, such tools can be helpful, but it is well accepted that they will only contribute to part of the picture. They must not be treated as providing final answers and should only ever be used in conjunction with good professional judgment. Using professional judgment means making space for thinking. Slowing down is all well and good in theory, but what if there is too much work? Overwork is a management problem, and ought not to be a problem for the individual professional. “Some hope”, you might say. Consider, however, that good, careful thinking and analysis lead to better decisions. And good decision-making means that those decisions stand the test of time. Decisions that frequently have to be revisited, revised and revamped actually create additional work. 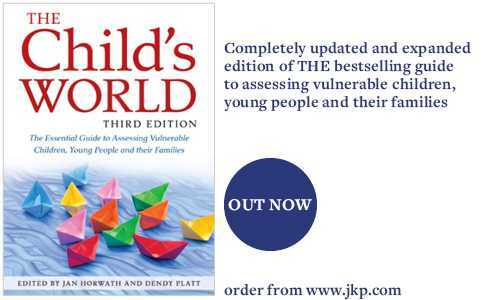 In the new edition of The Child’s World, which I recently co-edited with Jan Horwath, we cover the many different aspects of the assessment of vulnerable children, and professional judgement is a theme which we return to throughout. It has been written with busy practitioners in mind so that they can dip in to the chapters and quickly access summary information on specific topics, such as Parents with Learning Difficulties, Child Sexual Exploitation, and assessing Family and Community Support. Easily accessible information such as this can be a useful tool when there is little time for detailed background research. Visit the JKP website to read an extract from the latest edition of The Child’s World. The Child’s World launch conference is taking place on 18th March in York and has been designed as a collaborative learning event. Reduced conference fees for students and BASPCAN members are available and all participants will receive a free copy of The Child’s World (3rd edition). This entry was posted in Family Policy and Child Welfare by policystudies. Bookmark the permalink.